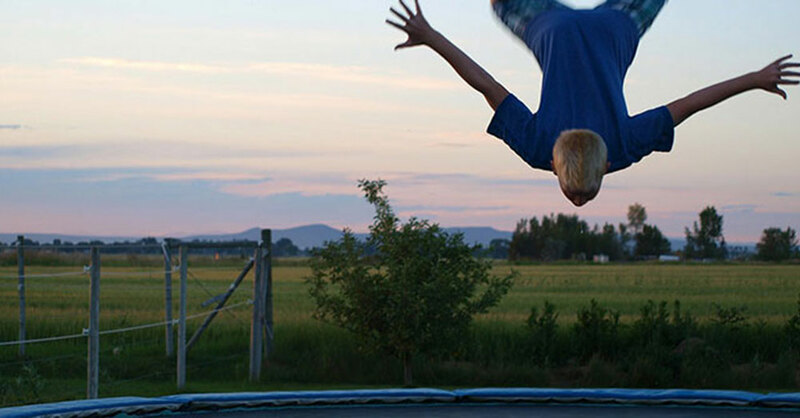 The concept of a trampoline is simple; it gives kids and adults alike a uniquely exciting jumping experience. Now, plain old jumping on one of these is a ton of fun, no one can deny that, but almost everyone wonders what kind of trampoline tricks they can pull off after a while. Children especially love to try flips, spins, and all sorts of daredevil maneuvers. Landing a front flip or back handspring is exhilarating, but every parent knows that a trampoline can be dangerous if caution isn’t used. So, this article is here to help you and your children understand how some of the coolest tricks are done as well as how to exercise safety when practicing them. Without further ado, here’s everything from the basic to the advanced. It is highly recommended to have a safety net enclosure on your trampoline so that a jump gone awry doesn’t send someone flying into the yard. Aside from that, make sure to pay attention to your child’s knees, ankles, and neck. A wrong landing can lead to injury due to the extra force being applied when jumping, but the bungee mat helps to cushion the vast majority of landings. For more information on trampoline safety, check out our article on the subject. On a safety scale of 1 to 10, with ten being the safest, these are an easy 10 out of 10. They’re a ton of fun and excellent for beginners of any age. Your kids are sure to love them, guaranteed. The first trick on this list is just called the spin. As you’ve probably guessed, all you have to do is spin around while in midair. This beginner’s trampoline trick is an excellent way for you and your children to get your aerial bearings before moving onto more complicated maneuvers. Most kids catch on to this one in no time, and yours might already be doing a full spin in the air, but how many times can they spin around before landing? It’s a lot harder than most people think to turn around multiple times in the air and stick the landing, which makes this challenge something any child can enjoy for hours. Another safe yet incredibly fun trick for your children to try out is the seat drop. As the name suggests, the goal is to land on your bottom and spring back up to your feet. This one, like the spin, will take a little bit of practice to pull it off just right. Once in the air, your child will need to pull their legs up in front of them so they can land on their rear, but the secret to the trick lies in the arms. As they land, they’ll need to place their arms and hands on their sides so they can push against the mat to get the force needed to pop back up on their feet. Before trying to pull off the trick in its entirety, have your children practice tucking their legs in while jumping up and down. Practicing this early on will come in handy as they muster the courage to try more advanced jumps. Slightly more complicated than previous two but still relatively simple and safer than advanced maneuvers, these trampoline tricks are something your kids will want to practice before moving onto anything more difficult. Plus, they amp up the fun to the next level. This one starts out simple but builds an essential foundation for two more complicated tricks. Have your child practice falling onto their back when on the trampoline mat. The goal is to land directly in the middle of their backs, which should be emphasized for safety. While this trick isn’t going to hurt anyone, practicing this landing will ensure no one gets hurt during the advanced tricks. After they get used to allowing themselves to fall, you can have your child practice using the momentum from the fall and springiness of the mat to jump back up onto their feet to complete the trick. While this one sounds simple, it takes a little practice to master. Before attempting any flips, it’s essential to practice handsprings first. The idea is to flip your body forward or backward but use your arms to help stick the landing. This will allow your child to get used to being upside down for a period of time, as well as help them to balance their body weight in the air. The front handspring is the easier of the two, which makes it the recommended one to start with. Standing straight up on one end of the trampoline, jump forward in a somersault motion and land on your hands. Then, use your hands to flip yourself back over onto your feet. The back handspring is performed the same way, except you would be jumping backward. Each of these will take time to get right. Make sure to encourage your children and remind them that practice makes perfect! Mastering both handsprings makes the transition to more complicated tricks like full front flips and backflips a whole lot easier. Each requires the jumper to tuck their limbs in and somersault in the air, but having better control over your center of gravity will help your children to complete the flip without landing on their head. Rather than cover these more dangerous maneuvers, we highly recommend you seek professional training for these tricks. Contact a local gym facility that staffs qualified coaches.